Pediatric Dentist in Las Vegas. Let’s face it, none of us really love going to the dentist—especially our children. But proper dental care is critical to your child’s overall health and well-being. Because going to the dentist can be scary for some children, we’ve worked to make it a fun, safe, calming experience. When your visit is over there will be smiles all around—including you! Smile Reef is the premier Pediatric Dentist office in Las Vegas and has been specially designed to be attractive, calming and inviting for your children. They’ll love the “tropical-surf-beach-scuba-adventure-ish” themes—including exploring the colorful salt water fish tank and interactive play place. More than just a cool dental office, Smile Reef is lead by Dr. Jaren Jensen, DDS. He’s a board certified Pediatric Dentist which requires additional years of schooling (on top his Bachelors degree and full Dental program) specifically designed toward applied child psychology, sedation procedures, disease prevention, speech development, etc. Additionally, the entire Smile Reef family has been specially trained and brings skills & personalities perfect for helping your child feel safe and comfortable when they’re with us. If you have a child who is not fond of going to the dentist, it may be hard to find the perfect children’s dentist in Las Vegas. Achieving outstanding pediatric dentistry results requires a children’s dentist who understands the apprehension that children can experience when going to the dentist. If you have been looking for a child’s dentist, Smile Reef is the perfect place to receive expert pediatric dental care. Focusing only on dentistry for children, Smile Reef is designed with a calm, beach-themed environment that helps children relax and have fun at the dentist. Aside from being an exceptional dentist for kids, Dr. Jaren Jensen also provides special needs dentistry, ensuring that children with special needs receive the unique treatment they need. If you need an excellent kid’s dentist who will ensure your child’s dental health, Smile Reef is the perfect fit for your family! You’ll love Smile Reef! You’re kids will love it too. They’ll want to come back again soon and that is great for everyone! 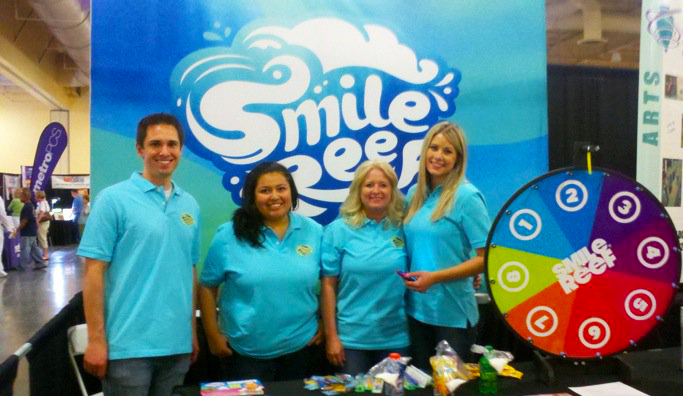 Call or stop by for a free consultation and see what Smile Reef has to offer you and your child’s dental health. We would love to meet you and your littles!